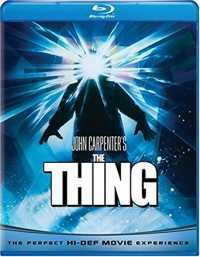 The Thing is a 1982 American science fiction horror film directed by John Carpenter and written by Bill Lancaster. Based on the 1938 John W. Campbell novella Who Goes There?, it tells the story of a group of American researchers in Antarctica who encounter the eponymous “Thing”, a parasitic extraterrestrial life-form that assimilates and then imitates other organisms. The group is overcome by paranoia and conflict as they learn that they can no longer trust each other and that any one of them can be the Thing. The film stars Kurt Russell as the team’s helicopter pilot, R.J. MacReady, and features A. Wilford Brimley, T. K. Carter, David Clennon, Keith David, Richard Dysart, Charles Hallahan, Peter Maloney, Richard Masur, Donald Moffat, Joel Polis, and Thomas Waites in supporting roles.